The 2017-18 season was a good one for the West Linn boys basketball team. Indeed, there were many teams around the state that would love to have been as good as the Lions were last year. But "good" just isn't good enough at West Linn. The Lions — after winning four straight state titles from 2013-16 and finishing third at state in 2017 — went 11-3 to finish second in the 2018 Three Rivers League race, 17-9 overall, then lost in the second round of the Class 6A state playoffs. On the down side of the 2017-18 season, the Lions failed to win the Three Rivers League for th first time in four years and missed the state tournament for the first time since 2010. For 2018-19, the Lions goals are as big as can be and they're determined to get back to the heights of Oregon high school basketball. "Our goal is to win league," said West Linn coach Tyler Toney. "This year, we have the toughest league by far and with only three seniors, it will be tough, but having a great junior class with a ton of talent, I think we will be right there." This year's team will be led by 6-foot-3 senior wing Cade Knutson and 6-3 senior wing Parker Durbin, along with a trio of returning all-leaguers — 6-4 junior guard Micah Garrett (second team), 6-0 senior guard Drayton Caoile (honorable mention) and 6-3 junior guard Bryson Crockett (honorable mention). "Cade Knutson and Parker Durbin lead by example on and off the court," Toney said. "They both are great team guys that always put the team success in front of personal success." 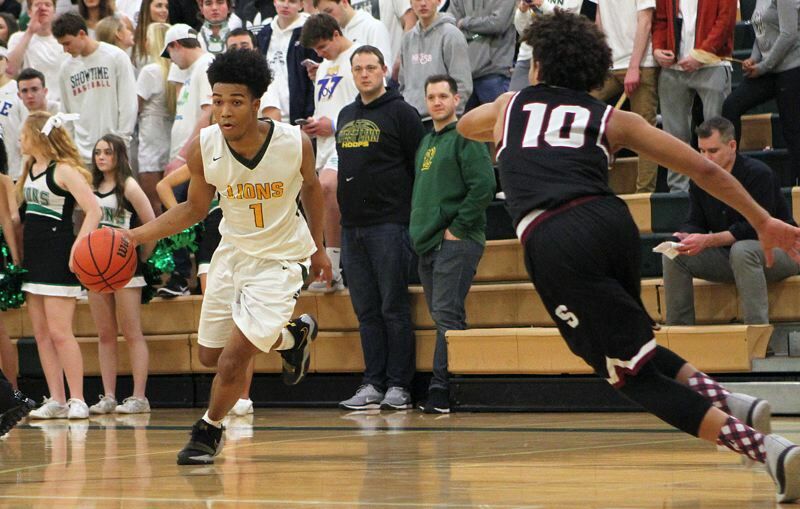 West Linn will also benefit from the addition of 6-3 senior wing Oreon Courtney — a first-team all-leaguer at West Albany last year who transferred to West Linn — and the return of 6-4 junior wing Damiko Tidmore Jr., another player with a ton of varsity experience. Joining that group in the regular playing rotation will be 6-7 junior wing Joe Juhala. That said, Toney knows his Lions have a lot of work to do if they hope to reach their lofty goals. "We will need to continue to get better on defense and make sure we play an up-tempo game," Toney said. Also ready to contribute to the varsity team are 5-11 junior guard Chris Zakariya, 6-8 freshman forward Mason Vanbeenen, 6-3 junior guard Gus Michelon, 5-11 junior guard Kelton Herrick and 6-1 junior guard Colton Young. Another varsity player from a year ago, junior guard Andre Best, transferred to Oregon City. The challenge in the coming league race is a big one, though, and the Lions know it. Toney said he expects Lake Oswego (the 2018 TRL champion) and Tigard to battle for the 2018-19 league championship. "Lake Oswego has good senior leadership with really good young players," Toney said, adding that "Tigard has Stevie (Schlabach) — he will be able to keep them in every single game due to how he scores." • To read the Lake Oswego boys team preview, click here.